No Wealth for the Commons? Glasgow Games Monitor Events. Browse: Home » No Wealth for the Commons? Glasgow Games Monitor Events. 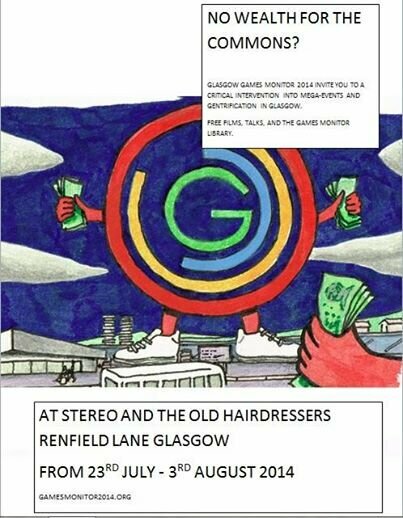 Throughout the period of the Commonwealth Games (23rd July to 3rd August), Stereo and the Old Hairdressers will host the Glasgow Games Monitor Library. Reading materials generated by Glasgow Games Monitor since it began in 2008 will be available to take away for free. The library will be situated within the bar area of Stereo and aims to bring together a range of reading materials which aim to contextualise, not only what the Games have entailed for the people of the East End of Glasgow, but what market-driven urbanisation entails for all of us. Read research primers on Clyde Gateway Urban Regeneration Company; the role of ATOS in the Commonwealth Games, Housing in Glasgow, a critical view of ‘Legacy’, and Work and Volunteering in relation to the Games. Also available are interviews with Margaret Jaconelli and the Save the Accord Campaigners. The Jaconelli family were violently evicted from their Dalmarnock home to make way for the Games Site, they continue to battle for a fair settlement from Glasgow City Council since having the family home Compulsory Purchased and subsequently demolished. Since the demolition of the Accord Day Centre in Dalmarnock, to make way for a Coach park for the Games, campaigners have been pursuing local and national government for a replacement building. As the curtains rise on the games, these fights continue. Schmidt’s documentary captures the build up to Vancouver’s Winter Olympics held in 2010, and reveals a familiar story of organiser’s false claims over the total financial cost, the environmental sustainability of the sporting urban mega-event. It also highlights the suppression of contestation and protest over the purpose and legacy of the Games in Vancouver. This documentary made for the BBC in 1982 shows Glasgow in the throes of both its rapid deindustrialisation, and the Glasgow East Area Regeneration (GEAR) project which ran from 1976 to 1987. The documentary features interviews with workers and shop stewards at Anderson Strathclyde in Bridgeton as the decision was taken to close the factory. The film invites reflection on who is really benefitting from cycles of publicly funded regeneration strategies. Anna McLauchlan will talk about recent research revealing the extent of swimming pool closures in Glasgow.